Abstract: Taking technological developments in urban mapping and the megacity phenomena of rapid change and sprawling space as its starting point, this essay provides a history of the present through a genealogy of maps of Montpellier in France, a rapidly growing modern city that provides examples from the earliest printed maps of the 16th Century through to the most recent innovations in public-sponsored 3D mapping. By tracing the shifting correlations of narrative elements, it places in historical perspective the relationship between those concepts, such as verticality and horizontality, perception and representation, which are problematised in the contemporary contexts of megacities and digital technology. N.B. For (French) copyright reasons, I’m only able to show on this site some of the images used in the article. Links to the images are provided for those I’m unable to re-use. Taking technological developments in urban mapping and the megacity phenomena of rapid change and sprawling space as its starting point, this essay provides a history of the present through a genealogy of maps of Montpellier in France, a rapidly growing modern city that provides examples from the earliest printed maps of the 16th Century through to the most recent innovations in public-sponsored 3D mapping (see Perdrizet, 2009). Rather than delineating a simple chronology from figurative drawings to geometric abstractions, or from analogue to digital representations, such archives reveal that the history of urban mapping has always involved the on-going reconfiguration of competing narratives. But this process of reconfiguration is exacerbated by the technological evolution of representational techniques, the rise of the megacity as a new model of urban change even for smaller, older cities, and theoretical developments, particularly in poststructural geography, which destabilise the notion of the city, rethink representation and problematise the relation between the material reality and representation of the city. By tracing the shifting correlations of narrative elements (Collier, 2009), we can place in historical perspective the relationship between concepts such as verticality and horizontality, as well as between perception and representation, problematised in the contemporary contexts of megacities and digital technology. The trajectory of these representational narratives and techniques culminates in the present tension between megacity phenomena that elude or confound representation, and simultaneous leaps in representational capacity afforded by technological advancements. As both a material and an imagined entity (Yeoh, 2006), and as a source of philosophical concepts as well as an object of analysis (Weintraub, 1997: 26), the very idea of the city has changed over time. Rethought from a post-representational (for an overview, see Kitchin, 2010) or non-representational (Thrift, 2007) perspective, it is argued that the city’s boundaries have become so permeable and stretched, culturally and socially as well as geographically, that it is no longer possible to conceptualise the city as a whole (Amin & Thrift, 2002). Meanwhile, representations of the city can only ever be metonymic simulations; that is, the ‘reality’ of the city can never exist outside of its representation, as the city itself is already a representation (Shields, 1996) and already a medium (Kittler, 1996), which cannot be reduced to a physical or built environment. The mutual constitutiveness of maps and territories complicates the extent to which we can differentiate between the reality and the representation of the city (Corner, 1999). Rather, the recognition that representations are integral to urbanism leads us to examine the ways in which the urban imaginary is renegotiated and reconfigured through a city’s representation. The synoptic, elevated cavalier perspective provides a recognisably figurative view of the city in its material reality, situating the city within a panorama of the surrounding territory. The emphasis is on the walled and guarded perimeter, and on the principal monuments within the fortification, privileging the tallest and most religious buildings (and the military security) of l’ancien régime. The aim is legibility – to give the viewer the impression of seeing the city from a familiar (realistic or ‘natural’) point of view. However, contrary to the traditional reading of early developments in printed urban representation, which constructs a clear break between figurative drawings and geometric abstractions, the influence of geometry on cartography is clearly in evidence in the use of perspective in the representation of the built environment within the fortified city, in contrast to the more ‘artistic’ impression of the terrain surrounding it. Nevertheless, the streets and monuments are presented in situ, and are ‘described’ more than ‘inventoried’, while the figurative perspective itself is ‘prescribed’ (Wood & Fels, 2008) as the valid way to view the city. 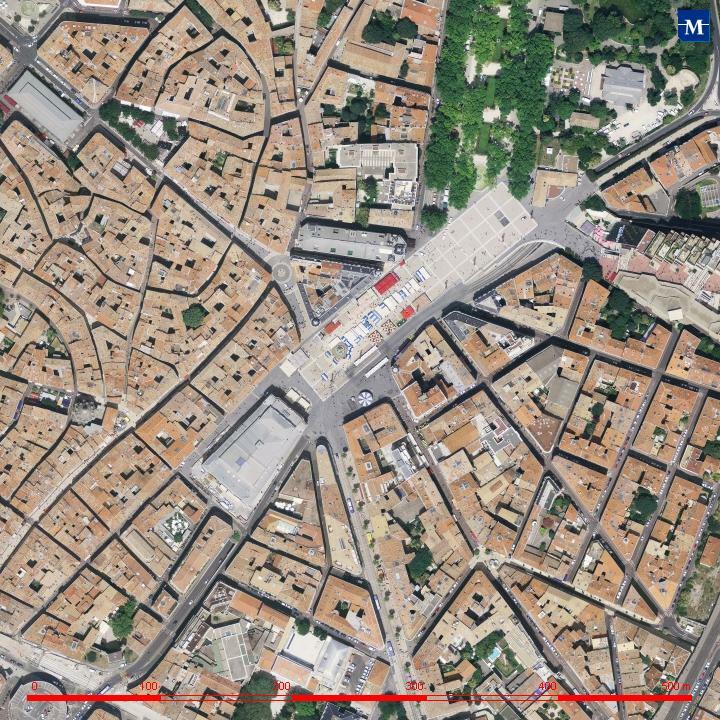 By the end of the 18th century, however, geometry had become very much the dominant characteristic (Boutier, 2005) in urban mapping, and with it the logic of calculated seeing from a fictional (impossible) perspective – that of the bird’s-eye view (see Fig. 2). This orthogonal projection upon a horizontal plain represented the city in an abstract, non-figurative way. Sacrificing the aim of providing the illusion of seeing the city from a realistic viewpoint, these vertical images from a fictional centre of observation altered the reality of the city to a conceptual construct – what the mind could only conceive (to paraphrase Le Corbusier, 1988) before aeronautics. This vertical order democratises what is horizontal by flattening it – treating each vertical structure on equal terms and in the same scale, rendering the city a 2D artefact of the cartographer (Bishop, 2004: 74) – and introduces calculation into the process of seeing, thus splitting perception from representation (Virilio, 1994). What is privileged here is the network of routes and boundaries within and around the city, demarcating property and aiding mobility. Focusing still on the man-made structures, the trees are represented in perspective, a residual category that remains from the previous dominant logic, helping to make the abstraction more legible. The presence of perspective suggests an alternative viewpoint within the picture, disturbing the general verticality and anticipating the composite images to come. The overall logic of this image, however, demonstrates the aim to make everything calculable. It constitutes a uniformalisation of methods and dematerialisation of urban space, where the city is ‘inventoried’ rather than ‘described’ in any recognisable way, and reduced to a set of abstract calculations. So although these examples are typical of the synoptic gaze of the city portrait in the first instance, and of the calculating gaze of the geometric plan in the latter, neither representation of the city as a whole can be seen as complete; in the sense that even these ideal types fail to cohere completely to the dominant logics of their own construction. Contradictions in the logic of these representations can be elicited in the depiction of what is marginal, such as the landscape around the city, or what is not part of the built environment. Furthermore, the relationship between the figurative and the calculative doesn’t follow a linear trajectory; there is rather a heterogeneity of assembled techniques. Towards the end of the 18th century, cartographers began to realise the limits of representing the complexity of the city in its entirety. In one of the increasing number of examples of partial representations (Fig. 3), we see the return of the elevated vantage point and a figurative view of the city. In such images, we can see the incorporation of hand-written details of measurements and calculations. At the same time, we also see certain aspects – such as the built-up area of the city on the perimeter of the image and other incidental elements such as pedestrians, trees and the seascape in the background – sketched without the aid of mathematical calculation. Recognising the limits of representing the city, we have in these examples merely one of the main sites on its outskirts, with the information we don’t normally see as part of the calculating process being made visible as part of the representation. And recognising the limits of the inventory or informationalisation of everything, we see a reverting back to descriptive sketching for what is not the object or target of the representation. With the rise of aeronautics (kites, balloons, then planes), the bird’s-eye view became less of a fiction and more of a realistic possibility, and with the coinciding birth of the camera, representations could be created more easily from successive designs, each from different points of view; as occasional anomalies in such images bear witness (Perdrizet, 2009). These oblique representations were the sum total of various takes, each taken from various points of view, in effect making visible what was invisible in their efforts to visualise everything, and abandoning (or, at least, complicating) the sovereignty of the unique centre of observation. Problematising the relationship between legibility and inventory, vision and information, these images suggest a non-linear trajectory from portrait to plan, in which the recognition of the limits in representing the city as a whole leads to a representation of the city in its parts, or with a more explicit focus on protagonistic elements of the narrative. The making visible of the process of calculation within the representation complicates the relationship between the display and the database, while its compositional production complicates that between the singular (image) and the plural (images). Although these analogue representations were technologically linked to the reality they conveyed by light, so constituting a relay between representation and perception, it would be too simplistic to assume that the shift to digital and its dependence on grids and algorithms constructs a barrier between these two realms (Cubitt, 2006). As these older images demonstrate, the relation has always been a complex one of mobility and fluidity. 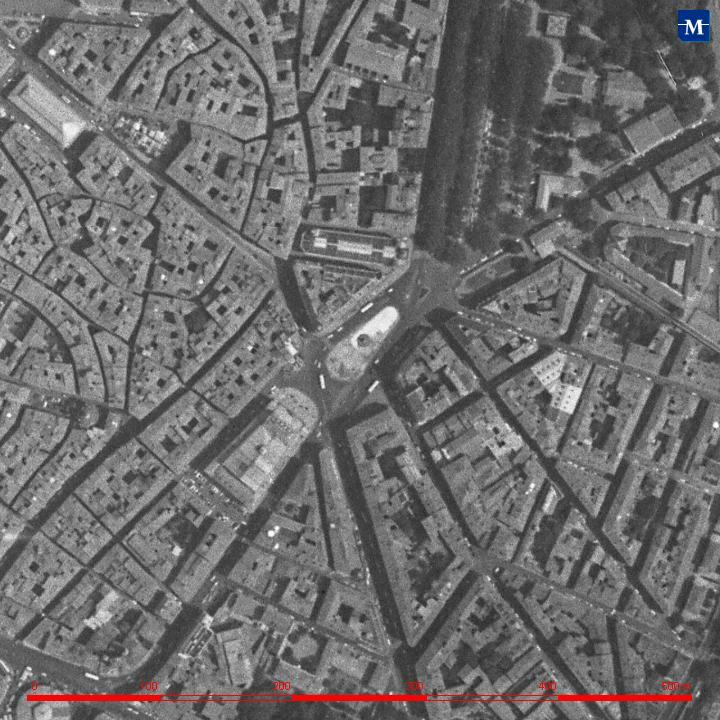 With aeroplane flyovers replacing the balloon, aerial photos became the norm for influencing geometric plans of flat areas of land, with two cameras eventually being used simultaneously to replicate stereovision and produce more legible images of urban terrains (see Figs. 4 and 5); resulting in a more topographically-sensitive verticality that no longer homogenises what is horizontal. 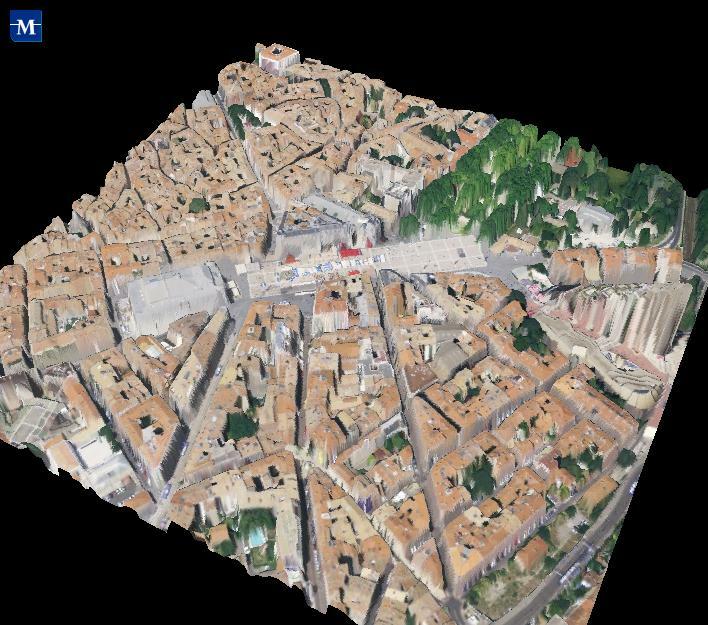 And in the contemporary 3D representations of Montpellier (see Fig. 6 and Video 1) – constructed by the city’s own geographical information department – the aerial photographs used are complemented by photographs from the ground (Perdrizet, 2009), suggesting a return of the horizontal from within the city. Whereas the aerial perspective relegates the ground to the background, the complementation of ground photos establishes a new relation between the terrain and its urban constructs. It also suggests a shift in the object and mode of representation – from the city as a whole, represented from a synoptic position outside the city, to representations of parts of the city from multiple perspectives, simultaneously within and beyond the city. Each digital re-presentation is a composite of images from different technical sources – aerial and satellite photography with GIS technology (itself a convergence of cartographic methods, statistical analysis and database storage facilities) – and each can be interacted with and manipulated and superimposed upon previous and alternative representations to create a 4D image (in Videos 2-4 you can watch the superimposition of aerial photographs of Montpellier from 1963-1964 and 2011; an 18th Century map and an aerial photo from 2011; and maps from 18th and 19th Centuries). This alters the function of time and space as another element of information to be calculated and converted into a (partly indexical, partly symbolic) visualisation. The provisional nature of the new images and the capacity to constantly update them favours not only the representation of new developments and urban growth, but also that of the old and decaying aspects of the city, thus complicating the function of time and problematising control over the message. The composite nature of these images and the possibility of superimposition also adjusts the function of the archive, so that the image is no longer just an artefact of the archive; rather, the archive is made present within the image, with each representation becoming an archive of the trajectory of technicities (Bishop, 2004:75) – that is, of the logics and techniques – of representing. With the increasing complexity of the link between representation and perception, the ‘image’ not only becomes simultaneously ‘images’ but provisional, constantly in need of being updated or reinterpreted, complicating the relationship between the (individual) image, the series (of some related images) and the archive (of all images; individual and series). This ‘city as archive’ is a city in a constant and processual state of becoming; its representation no longer fixed but in constant and multi-mediated modification (Del Casino & Hanna, 2005). Although the virtual ‘global village’ represented by Google Earth provides the paradox of being simultaneously everywhere and nowhere, and contributes to the loss of the city within the flows of globalisation (Virilio, 2010), and while these views of Montpellier from the city’s own public services also remove the synoptic point of view, their multiple viewpoints (and those of an increasing number of public initiatives around the world) are linked (or confined) to the city in ways that an international corporation with a global perspective cannot be, in effect redrawing the virtual boundaries of the city, and the relation between public and private ‘ownership’ of virtual cities. In contrast to Google’s objective, as a private multinational corporation, of indirectly making a profit from the information they collate from urban representations – an objective which privileges larger global cities with higher resolutions and entirely neglects the representation of many smaller territories – the objective of national endeavours such as France’s Géoportail, or local initiatives such as Montpellier’s Delta programme, is public service – providing public information to the general public of a fixed territory, consequently ‘finding’ or reclaiming the city within the flows of virtualisation. Additionally, international collaborative efforts, such as OpenStreetMap, demonstrate the desire for free as well as editable maps, and to move away from the proprietary model towards one based on the idea of the (interactive) commons. The ‘oblique function’ in these 3D renderings is less about the end of the vertical axis of elevation (Armitage, 2000:4) – that starting point remains – than the shifting role of the horizontal in a new configuration; no longer a permanent plain viewed from above, but a provisional and malleable surface to be viewed from multiple perspectives, often simultaneously, through diverse media. Speed is important, not just for how up to date the image is, but in terms of the altered temporality of the image (which can be superimpositions of multiple points in time) and for the fluidity of movement between perspectives and between objectives (altering the feature to be highlighted or removed) (see Video 5 for a video highlighting the energy consumption of individual buildings). Further, these changes demonstrate not simply a splitting of the modes of perception and representation (Virilio, 94: 49) but a shift in the relationship between the different means of perception and representation, where visualisation and informationalisation no longer precede or proceed from one another, but are always-already mutually constitutive. Both digital archives and megacity phenomena, therefore, problematise the relationship between the narratives of verticality and horizontality, perception and representation, time and space. Through a focus on the ongoing reconfiguration of these narrative elements in the representation of a modern city, we can see that it is the significance of speed and the altered function of the horizontal that are becoming the new guiding elements, both of which are essential to an understanding (and a literal and figurative view) of megacities (Bishop & Dawes, 2010); while megacities, in turn, can help us to better understand contemporary configurations of these digital narratives of speed and horizontality. The excesses of the megacity – the rapidity of its growth and the spread of its horizontality – confound its non-metonymic representation, and are only partially captured by even the most recent technological developments. Urban representation in the new order of the megacity is a process of constant re-territorialisation (Kitchin & Dodge, 2007); more a set of unfolding practices than the construction of fixed products. To the extent that the city was already a mediated representation, a genealogy of the urban imaginary helps us to see the contemporary megacity as a multi-mediated re-presentation; informational and virtual as well as material (Shields & Lozowy, forthcoming); an always provisional and malleable surface; a mobile and relational object open to contested interpretations and ceaseless recontextualisations (Pickles, 2004); and a contradictory object that eludes visualisation the more it is made visible. Acknowledgments: Thanks to Ryan Bishop for comments on successive drafts of this article, and to Franck Perdrizet, whose article ‘Montpellier en Perspective’ provided the inspiration for this essay, and who also introduced me to Montpellier’s archive material and Delta programme. Corner, J. (1999) ‘The agency of mapping: speculation, critique and invention’, in D. Cosgrove (ed.) Mappings, London, Reaktion Books. Del Casino, V.J. and Hanna, S.P. (2005) ‘Beyond the “binaries”: A methodological intervention for interrogating maps as representational practices’, ACME: An International E-Journal for Critical Geographies, 4(1): 34-56. Kitchin, R. and Dodge, M. (2007) ‘Rethinking maps’, Progress in Human Geography, 31(3): 331-44. Pickles, J. (2004) A History of Spaces: Cartographic Reason, Mapping and the Geo-Coded World, London: Routledge. Wood, D. and Fels, J. (2008) The Natures of Maps: Cartographic Constructions of the Natural World, Chicago: University of Chicago Press. Simon Dawes works at Université Paul Valéry – Montpellier 3 in France, and as Editorial Assistant and Website Manager of Theory, Culture & Society and Body & Society, as well as Editor of Networking Knowledge, the Journal of the MeCCSA Postgraduate Network.